A beautiful pop waltz written by Paul Simon is now reborn as a tasteful arrangement for vocal ensembles. Intriguing reharmonization and great counterpoints add sophisticated colors to the song which truly suit the nature of Paul Simon's lyrics. SATB with rhythm section. Optional Soprano Sax solo. 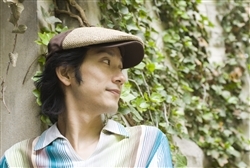 TSUNENORI ''LEE''ABE is the founder, arranger/composer, producer, performer and leader of the Boston-based vocal quartet, Syncopation, which has been performing at numerous jazz festivals and clubs in the U.S. and Japan. Lee is also active as a solo jazz vocalist/singer-songwriter and frequently visits his homeland to give clinics and workshops. As a graduate of the Berklee College of Music with a dipolma in Jazz Composition, he has worked with jazz luminaries including Grammy recipient Phil Wilson, Luciana Souza, Tiger Okoshi, Carlos Kanno and Richard Evans.